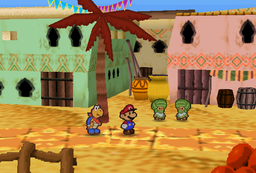 Dry Dry Outpost is a small town at the east end of Dry Dry Desert in Paper Mario. Little Mousers and Dryites live in the town. Moustafa is the leader here. Mario and his partners come to this town in Chapter 2. After some information gathering (specifically, buying a Dried Shroom and a Dusty Hammer in order in the shop), they are allowed to see the town leader, Moustafa, and receives the Pulse Stone from him. The Pulse Stone then allows them to proceed further in Dry Dry Desert. There is a shop and a Toad House in the outpost. 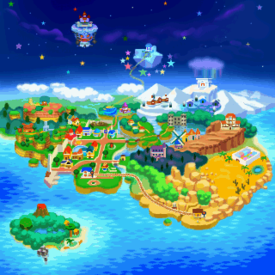 Merlee also lives here and can, for a fee, cast a spell on Mario which will occasionally give him several advantages in battles. Later in the game, Mario can optionally go back here to complete several sidequests such as letter delivery, Koopa Koot's favors, and Master Poet's favor. There is a shortcut warp pipe in the Toad Town Tunnels, which provides a faster way to go to Dry Dry Outpost. The in-game map description reads, "It's a small desert town that has many inhabitants for its size. You'll find a Toad House and a shop here." In Paper Mario: The Thousand-Year Door, Lumpy mentioned that he visited Dry Dry Outpost during his quest to strike oil. Mario can learn about Lumpy's visit by listening to "Part 3: A Helping Hand", the third tale in his adventure. In addition to the items listed below, Little Mouser's Shop has several items on sale. 64 Star Pieces in total can be obtained from Chuck Quizmo here. Letter On the roof of the Toad House. Given by Mr. E after giving him a letter from Koover. Given by the owner of Little Mouser's Shop after giving him a letter from Miss T..
Star Piece Under a hidden panel on the roof of the most eastern house. Red Jar Given by the owner of Little Mouser's Shop after purchasing a Dusty Hammer, a Dried Pasta, another Dusty Hammer, and a Dried Shroom in order. Crystal Ball Given by Merlee while doing Koopa Koot's 8th favor. Melody Given by the composer in the pink house after bringing him Lyrics. Pulse Stone Given by Moustafa after he reveals his true identity. It's Dry Dry Outpost. Lots of Dryites and Nomadimice live here. I'm so happy to find civilization after crossing that desert. Despite the climate, lots of travelers seem to come here. Still, they can't get that many tourists. It's too hot! I heard that this town was originally founded by thieves from the desert. It's a pretty mysterious town, don't you think? There are all kinds of stories and legends about this place. The residents around here love all those old tales. Little Mouser getting Mario's hint. Moustafa reveals his true identity. Mario talking to a Dryite. The Star Piece in Dry Dry Outpost. This page was last edited on July 23, 2018, at 18:19.